Tang Dynasty 唐朝 (618-907AD) was one of the most brilliant and dynamic dynasties of China. Tang might reached a height, Chinese power was projected into Central Asia, and cultural influence was spread throughout East Asia. Japan, in particular, adopted most of the Tang culture and kept it with some local adaptation. Japan has kept the Tang culture alive and we had to visit Kyoto and Nara to see what Tang architecture and gardens looked like. Here Sally and I visited the Golden Pavilion in Kyoto. Chinese architecture and styles underwent constant development from nomadic invasions, cultural development and changes in taste. In addition, Chinese have a bad habit of burning down previous dynasty’s structures when a new dynasty is established. Therefore, the subtle dignity and subdued elegance of Tang styles has changed gradually into the colorful and ornate style of Qing Dynasty we see today. 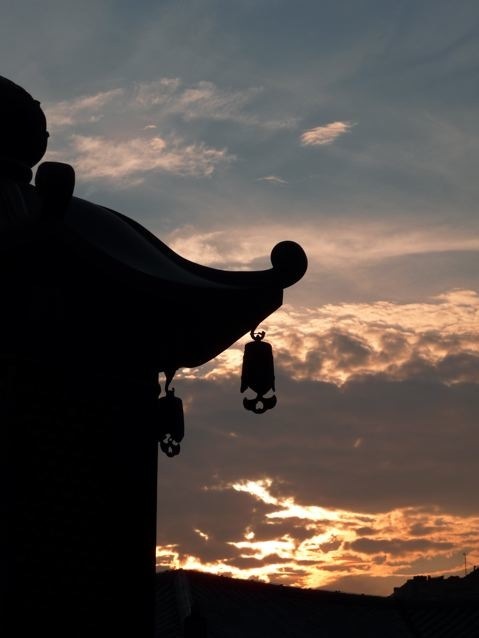 We dislike the colorful and showy style of Qing architecture and love the quiet elegant Tang style. Archeologists lament how few Tang Dynasty buildings survive to this day. 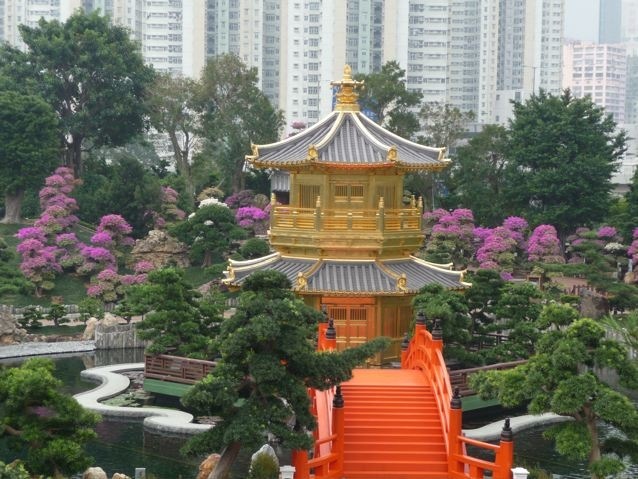 Fortunately, a Tang style temple and garden has been painstakingly built in Hong Kong. 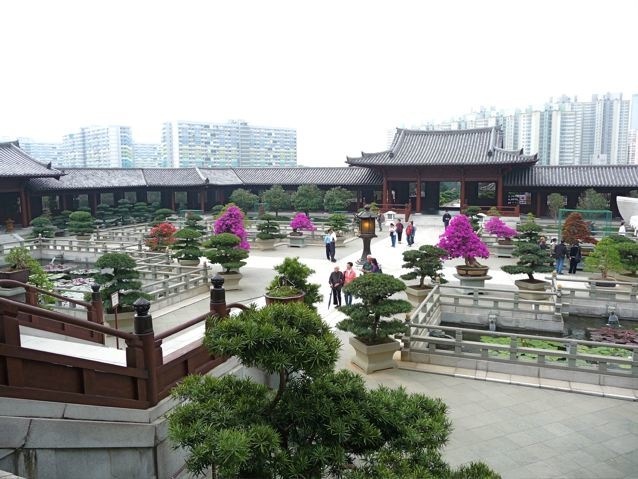 This is the most authentic and the largest Tang style building complex and garden in all of China. 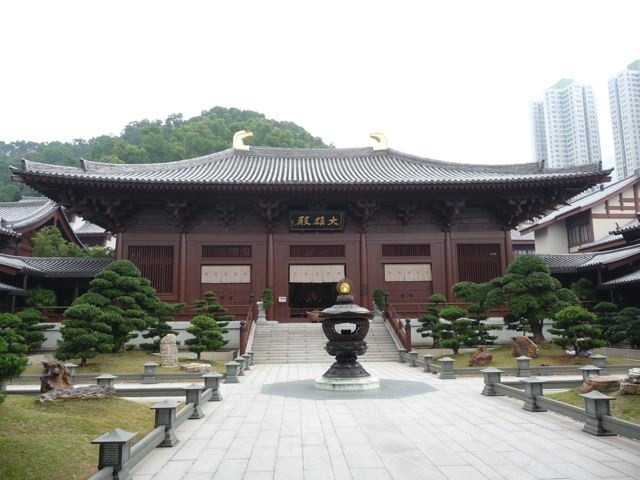 The temple is a nunnery Chi Lin Nunnery 志蓮淨苑 built in ten years at the cost of US$100 million. It was designed by Chinese and Japanese architects, and the buildings were built traditionally without nails. 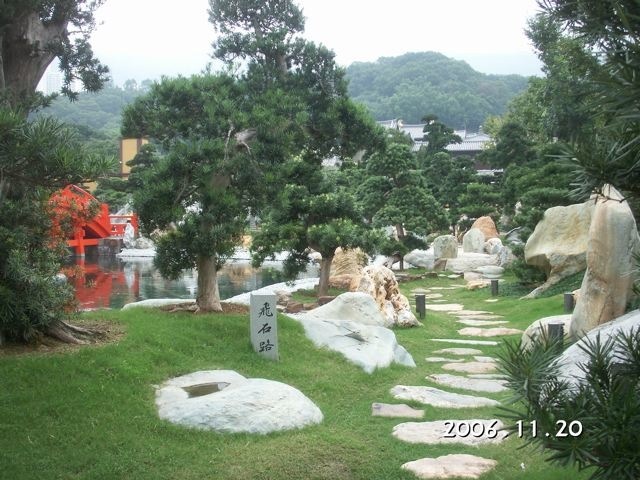 The Nan Lian Garden 南蓮園池was completed in 2006 and is adjacent to the nunnery. 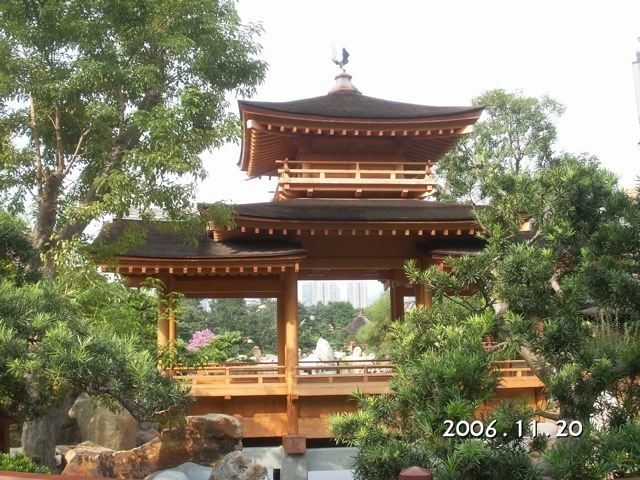 It was funded by the government of Hong Kong as a public park. 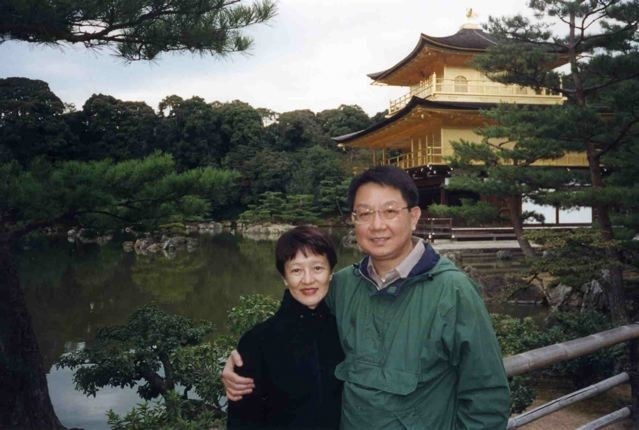 Together, these two present a most meditative and beautiful retreat in this bustling city. The garden has hundreds of transplanted mature trees. 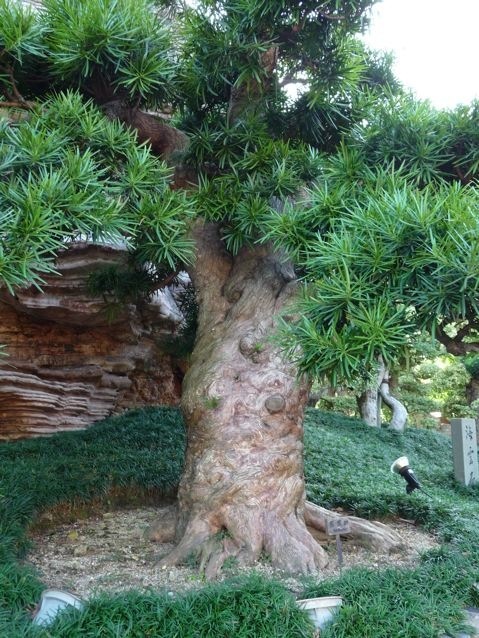 Many of them are the Buddha pine 羅漢松 highly valued in China. 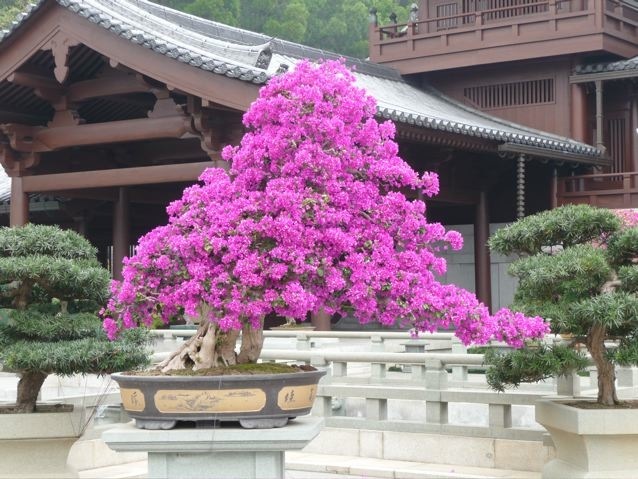 Thieves would come into Hong Kong wilderness to steal such trees and smuggled back into China. Here, a stone path is tugged into a corner of the garden. This mature Buddha pine has gnarled bark on its massive trunk. 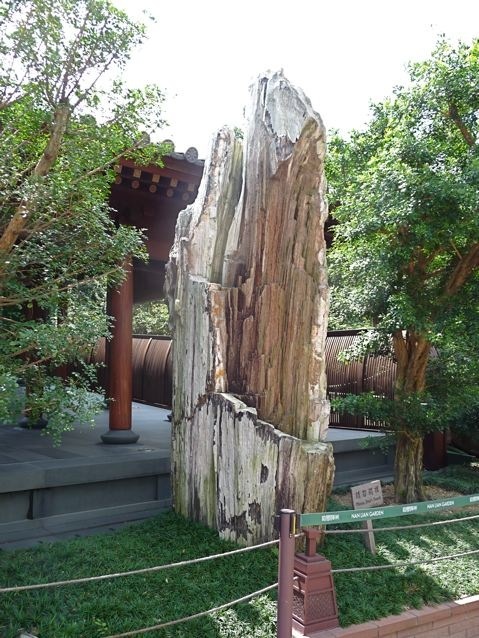 The garden displays many fossilized trees. This one is well preserved, showing a rotted center when it was fossilized. 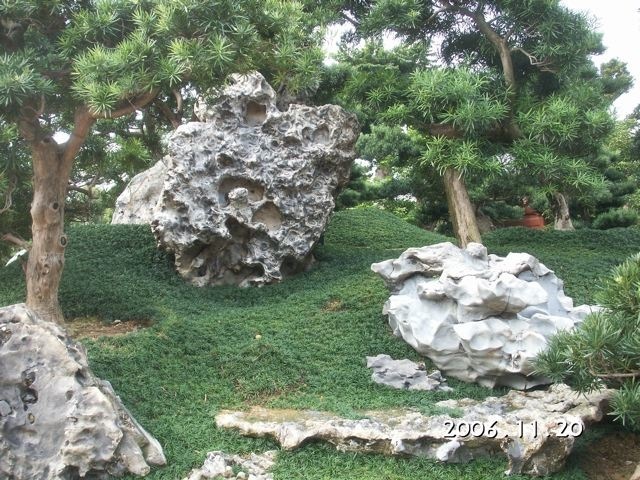 Beautiful rocks were scoured from all China to be displayed here. This is my favorite rock with layers of stratified rocks eroded into a lovely shape. 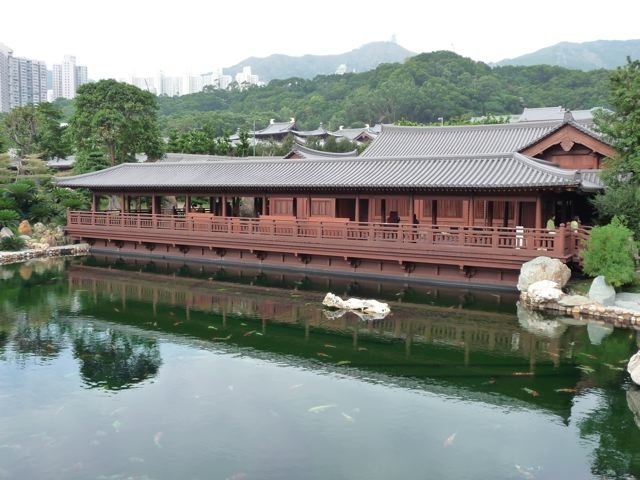 A tea house sits by a fish pond and backed by the buildings of the nunnery. 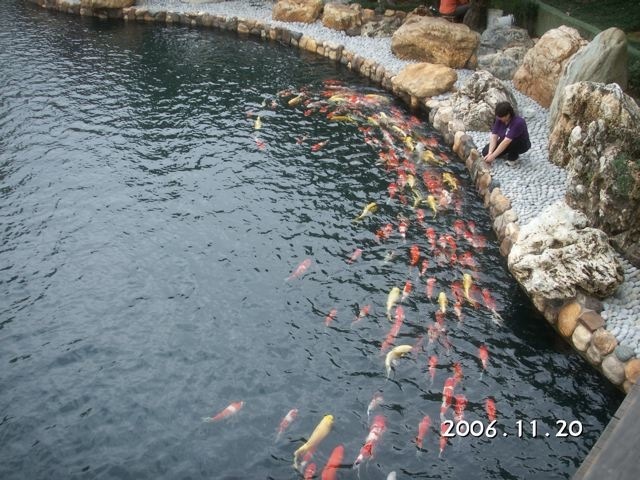 Hong Kongers learned to queue up at events and apparently the hundreds of kois in the fish pond also learned to queue up at meal time. 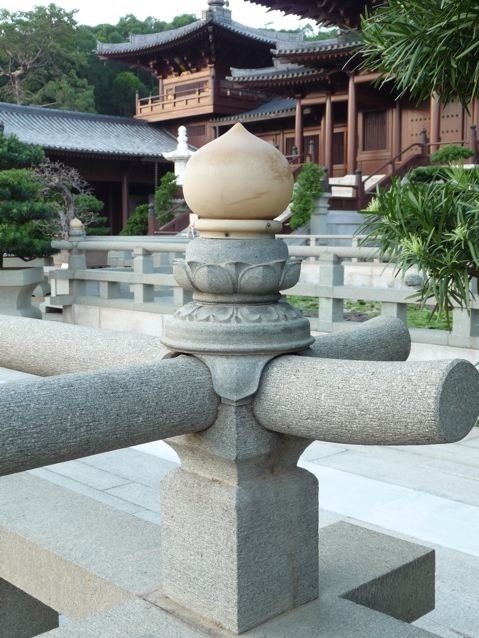 A Tang style footbridge and the graceful ornament atop the structure. 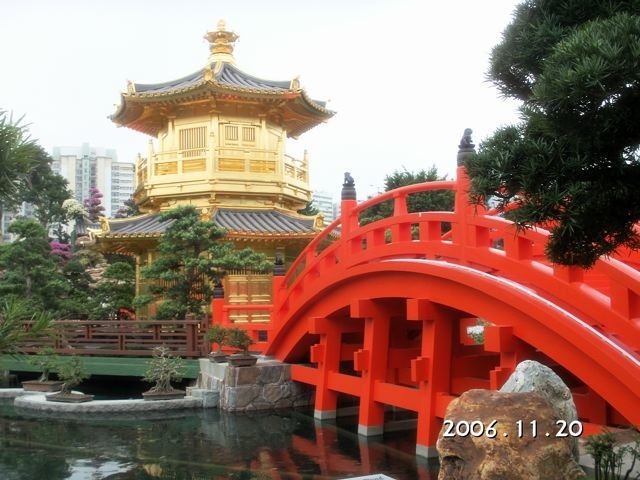 Golden pavilion and vermilion wooden arch bridge are usually linked to Kyoto, Japan. I was happily surprised that such beautiful architecture were originally Chinese Tang buildings. The pavilion, bridge and bougainvillea trees are surrounded by a concrete jungle. 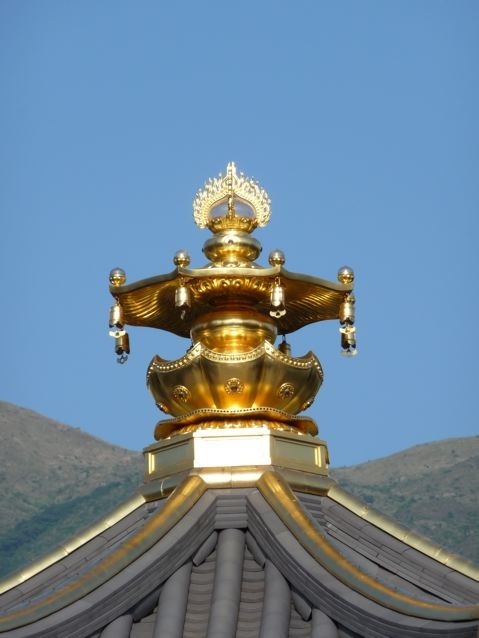 The gold gilded ornament atop the pavilion is delicately beautiful. 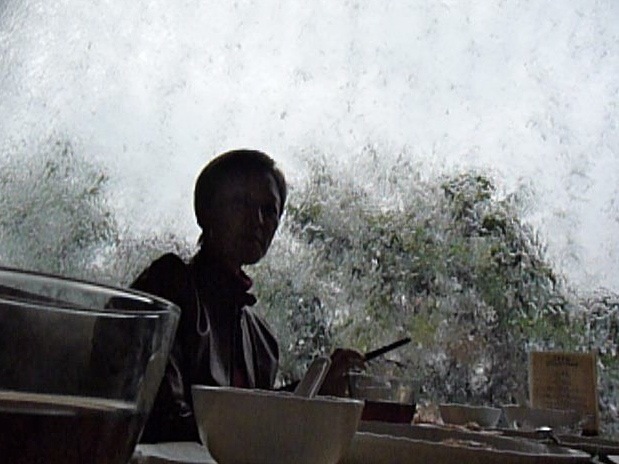 We had lunch in the vegetarian restaurant in the garden, next to the picture window washed by a waterfalls outside. 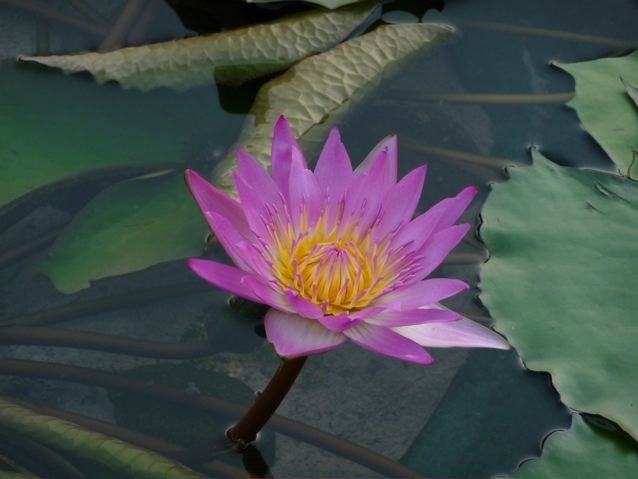 Upon entering the nunnery, there are four lotus ponds in the courtyard. The lotus ponds have scattering of lotus blossoms. The detailing of the nunnery building is delicate, subtle, and quietly elegant. These are the qualities of the architecture of the Great Tang 盛唐 period. Japanese architecture retained these characteristics and added their uniquely Japanese flavor to them. 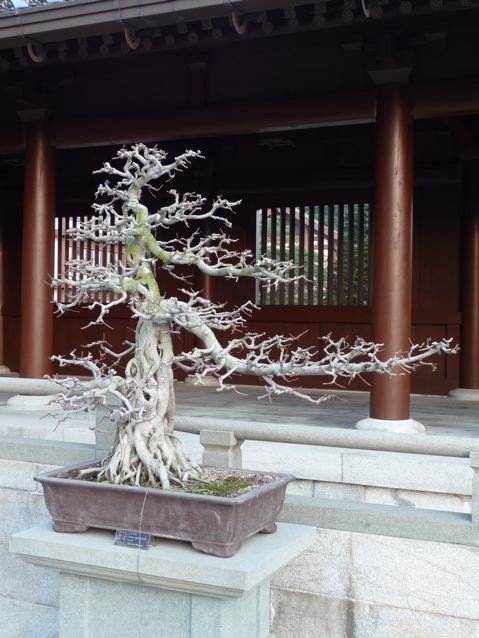 The complex has hundreds of bonsai plants, any one of them would immensely beautify my home. 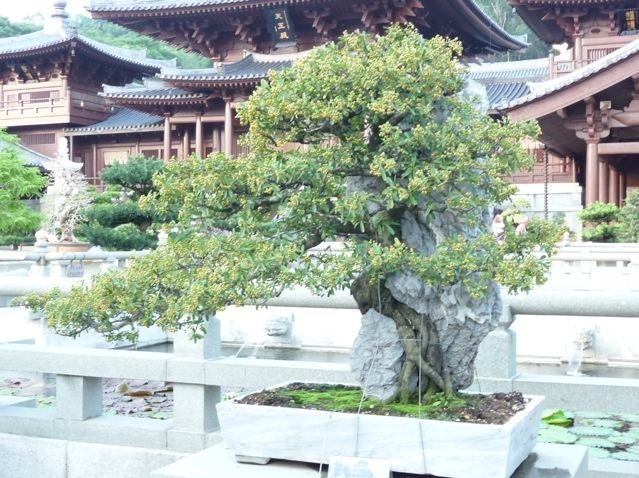 Caring for these bonsai plants require constant attention by professional gardeners. 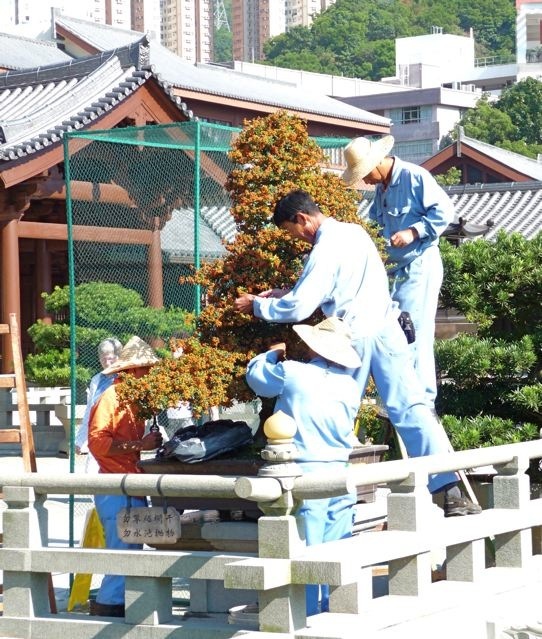 These three men carefully trim a fruiting miniature tree. 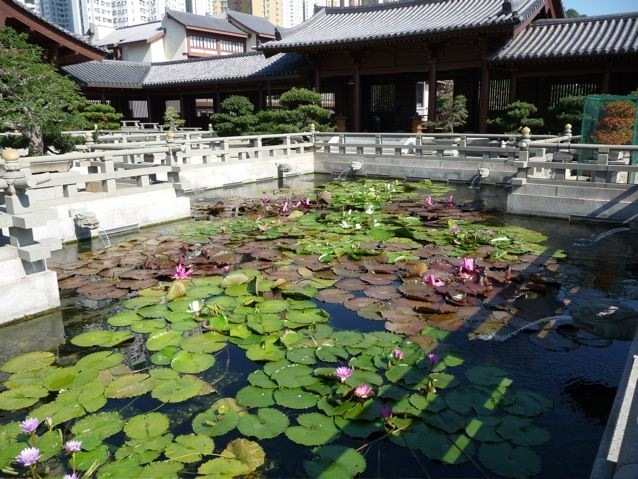 Another view of the court yard with lotus ponds. This is the Tang style wooden pagoda in the nunnery compound. The main hall of the temple complex sits inside another courtyard. This courtyard is surrounded by buildings and subtly planted with Buddha pines. 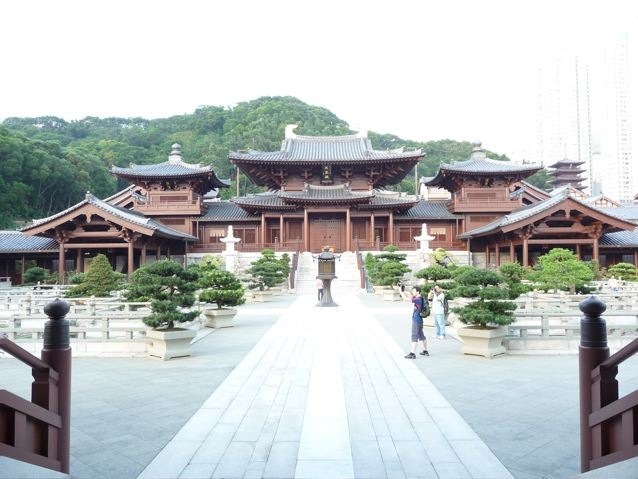 Although there is an incense burner in the center of the courtyard, the public is not allowed to burn incense in it, unlike other temples in Hong Kong. 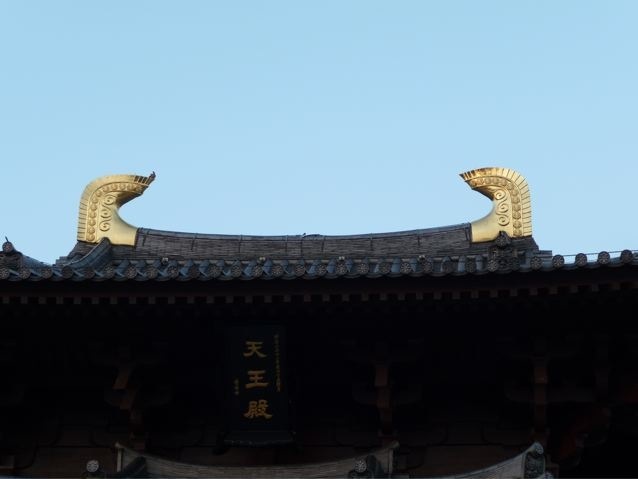 These two golden decorations on the ridge of the hall roof is very typical of Tang style buildings. 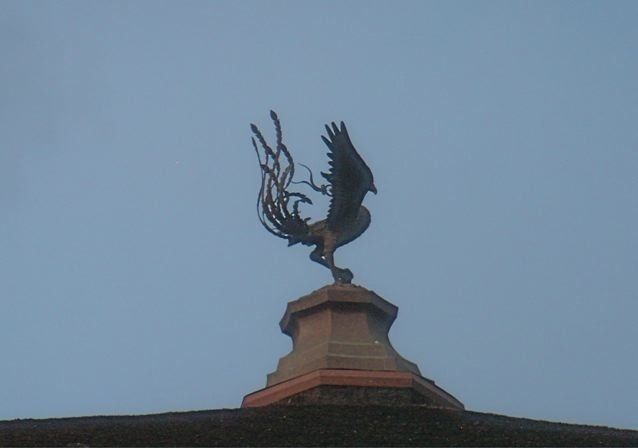 They add dignity and strength to the feel of the building. Sunset in the nunnery brings a day to a close. Posted by Robert Wu on Sunday, December 28, 2008, at 6:46 am. Filed under Uncategorized. Follow any responses to this post with its comments RSS feed. You can post a comment or trackback from your blog.